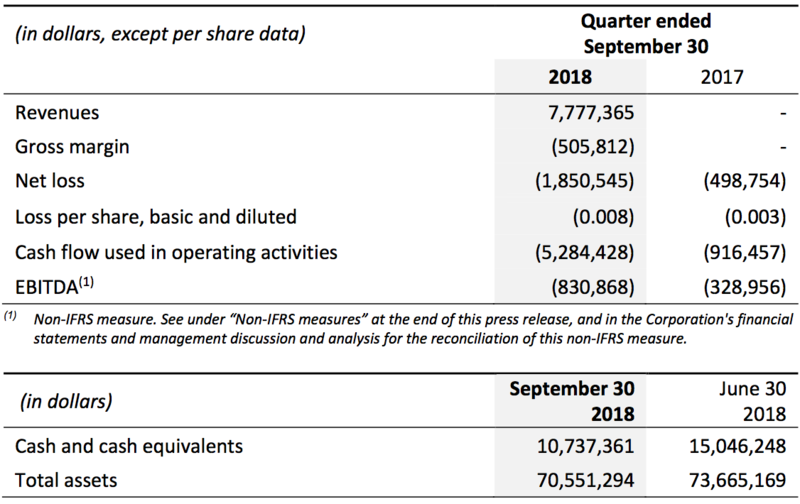 Montreal, Quebec, Canada, November 29, 2018 – MONARQUES GOLD CORPORATION (“Monarques” or the “Corporation”) (TSX: MQR) (OTCMKTS: MRQRF) (FRANKFURT: MR7) is pleased to report its results for the first quarter ended September 30, 2018. Amounts are in Canadian dollars unless otherwise indicated. Revenues of $7.8 million in the first quarter from the sale of 3,272 ounces of gold combined with revenue from custom milling, which grew by 16% during the quarter. Net loss of $1.9 million or $0.008 per share, diluted, compared to a net loss of $0.5 million or $0.003 per share, diluted, last year. Strong financial position, with $10.7 million in cash. On November 14, 2018, the Corporation received final approval for the listing of its common shares on the Toronto Stock Exchange (“TSX”). Monarques’ common shares started trading on the TSX on November 15, 2018 (see press release). 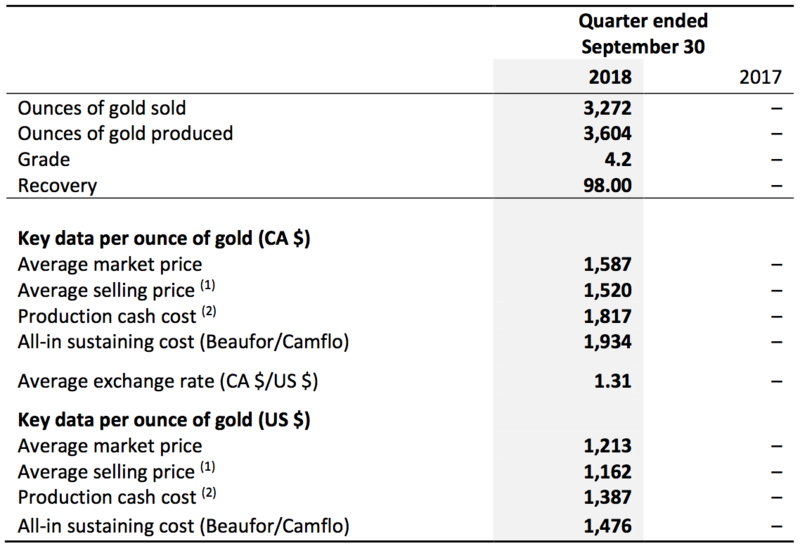 (1) The average selling price for the 2018 three-month period would be $19 higher if gold deliveries (861 ounces for the quarter) to Auramet in connection with deferred revenues for the period had been recognized at market price on the date the agreement was entered into on October 2, 2017, instead of at the recorded price, representing the amounts received from future gold production divided by the ounces to be delivered. (2) Production cash cost is a non-IFRS measure of financial performance without a standard meaning under IFRS. It may therefore not be comparable to a similar measure presented by another company. See "Non-IFRS measures" in the Corporation's management discussion and analysis for the quarter ended September 30, 2018. Monarques Gold Corporation (TSX: MQR) is an emerging gold mining company focused on pursuing growth through its large portfolio of high-quality projects in the Abitibi mining camp in Quebec, Canada. The Corporation currently owns close to 300 km² of gold properties (see map), including the Wasamac deposit (measured and indicated resource of 2.6 million ounces of gold), the Beaufor Mine, the Croinor Gold (see video), McKenzie Break and Swanson advanced projects and the Camflo and Beacon mills, as well as other promising exploration projects. It also offers custom milling services out of its 1,600 tonne-per-day Camflo mill. The forward-looking statements in this press release involve known and unknown risks, uncertainties and other factors that may cause Monarques’ actual results, performance and achievements to be materially different from the results, performance or achievements expressed or implied therein. Neither TSX nor its Regulation Services Provider (as that term is defined in the policies of the TSX accepts responsibility for the adequacy or accuracy of this press release.